Whiskey elitists of the world unite. Then geek out. The brown stuff get all whiskey2.0 on this social networking site called Whiskey connosr. The tag cloud looks delicious. Connosr lets users catalog, review, and rate whiskeys you own and have tried. You can share those reviews with friends and check out what they’ve been drinking, then add their favored spirits to your wish list for future sampling. 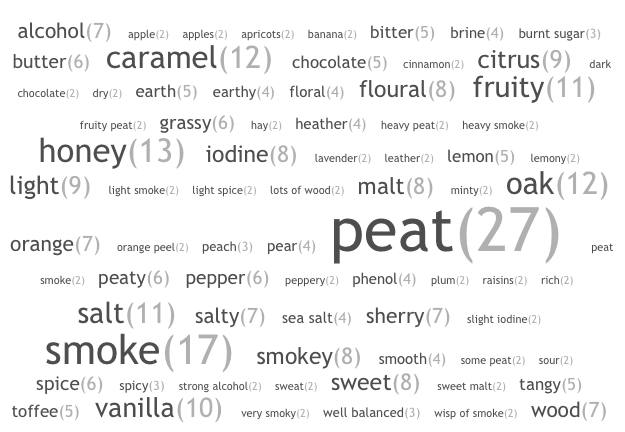 The site has extras that make tracking and reviewing whiskey even more enjoyable (if that’s possible), like maps of distilleries, calendars of events detailing things like tours, tasting events, and whiskey-centric gatherings, and the ability to browse whiskey reviews via a tag cloud. Looking for a peaty taste with smokey overtones? There’s a spot in the tag cloud and a whiskey to fit your request. Did you know? You can’t spell inspiration without spirit(s).